THIS morning Ernst Zündel was removed from a Tennessee jail -- where he had been held since his arrest on February 5 at his home outside Sevierville -- and taken to Atlanta, and from there to upstate New York. Today at 6:00 p.m., Eastern time, he phoned Mark Weber at the IHR office from an US immigration detention center in Batavia, New York, not far from the Canadian border, to report on the situation. US authorities have issued an order barring him from the United States for twenty years, Ernst said. It is likely, he added, that he will soon be deported to Canada, where he lived for 42 years as a permanent resident. He then could be held in prison for having violated a "Human Rights Tribunal" ruling that declared unlawful the "Zundelsite" web site, which his wife, Ingrid Rimland, has run from the United States. Ernst is in good spirits, eagerly discussing measures to be taken to deal with this new challenge. He said that he no money with him -- "not a red cent" -- because he took along no money or credit cards when he was arrested on the 5th. Ernst and Ingrid are relieved that he was not deported to Germany, the land of his birth and citizenship, where he faces years of imprisonment for violating the country's "Holocaust denial" law. The arrest and deportation of Ernst is an outrage, especially considering that he is married to a naturalized US citizen, and has never been convicted of any crime in the United States or Canada. As anyone who knows him well can testify, he takes great care to obey the law and abide by legal regulations. It appears that US authorities singled him out for deportation, using the pretext of supposedly violating a procedural regulation -- while ignoring millions who have been living in the United States unlawfully for years. 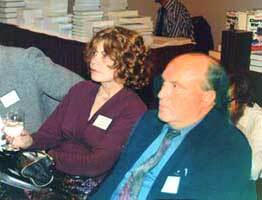 For more about Ernst Zundel, his arrest, deportation and background, see the IHR web site, especially "Authorities Prepare To Deport Ernst Zündel"
Friday, February 14, 2003 Ernst Zündel will be deported from the United States within the next few weeks, say US immigration authorities quoted in recent newspaper reports. It is not yet clear if he will be sent to Germany, the country of his birth and citizenship, or to Canada, where he lived for years as a permanent resident. The controversial Holocaust revisionist publisher and civil rights activist was arrested Feb. 5 at his home in eastern Tennessee, and since then has been held in the nearby Blount County jail. His wife, Ingrid Rimland, was present when three agents of the US Immigration and Naturalization Service and two local law enforcement officers took him away in handcuffs. An INS official in New Orleans says that Zündel will remain in jail until his deportation. Ingrid is urging supporters to publicize her husband's arrest on what she says amounts to a "minor immigration violation." Supposedly because he missed a procedural hearing, he is technically now in the US illegally. Ingrid, a naturalized US citizen and a distinguished author in her own right, maintains the "Zündelsite", which contains details about Zündel's recent arrest, updated information about his status since then, and numerous items about her husband's life and work. For years she has written and distributed a daily "ZGram" message by e-mail. She spoke about the arrest, her efforts since then on her husband's behalf, and her fears for the future, as a guest on the Jeff Rense radio program, Monday evening, Feb. 10. She expressed concern that if Ernst is deported to Germany, he could be imprisoned for years because his dissident views on the "Holocaust" are unlawful there. Mark Weber, director of the Institute for Historical Review, also appeared on the program at Ingrid's request. He described Zündel as a friend and civil rights activist who has waged costly and drawn-out legal battles in Canada for basic liberties. Zündel was a defendant in two major trials in Toronto, which concluded with a ruling by Canada's Supreme Court that the archaic law under which he had been charged was unconstitutional. He thus won a victory for the civil liberties of all Canadians, said Weber. In the second of those two trials, Weber testified for five days as an expert witness on Zündel's behalf. Ernst has addressed two IHR Conferences, 1994 and 2000. Ernst Zündel, a towering figure in the worldwide Holocaust revisionist movement, was born in 1939 in a small town in the Black Forest region of southwestern Germany. He emigrated to Canada at the age of 19, where he soon married and became the father of two sons. It wasn't long before he made a name for himself as a successful graphic artist whose work has appeared, for example, on the front cover of Maclean's, Canada's national news magazine. It was at about this time that he chose to dedicate himself to the great task, as he sees it, of redeeming the sullied reputation of his German nation and people. Through the Samisdat publishing house he founded, he distributed worldwide a prodigious quantity of books, booklets, leaflets, newsletters, and audio and video cassettes. Simon Wiesenthal, the well-known "Nazi hunter," has called Zündel the world's number one distributor of allegedly dangerous literature and cassettes. Over the years his powerful enemies have done everything they can to silence him, including several attempts on his life. Ernst Zündel, who sometimes describes himself as a "Swabian peasant," is an outgoing, good-humored man who is blessed with a rare combination of unflagging optimism and practical ability. He maintains this infectious spirit even under very trying conditions. He is an unusually alert and sensitive individual with a keen understanding of human nature. He knows how to persuade, cajole and encourage his supporters to give their best for the greater good. He inspires confidence, loyalty and even affection. Zündel is probably best known for his central role in the "Holocaust Trials" of 1985 and 1988. He was brought to court in Toronto on a charge of "publishing false news," and specifically for publishing a reprint edition of a booklet entitled Did Six Million Really Die?. To wage the legal battle that was forced upon him, he brought together an impressive international team of revisionist scholars, legal specialists, researchers, and many others. From numerous libraries and archives in North America and Europe, this group assembled at "Zündelhaus" one of the most impressive collections of evidence anywhere on this chapter of history. Zündel's two lengthy trials -- the 1985 trial lasted two months, and the 1988 trial lasted four months -- have been the closest thing anywhere to full scale debates on the Holocaust issue. For the first time ever, "Holocaust survivors" and Holocaust historians were closely and critically questioned under oath about their claims and views. These witnesses included Raul Hilberg, author of the standard text, The Destruction of the European Jews, as well as Rudolf Vrba, whose claims about Auschwitz have been a keystone of the extermination story. The confusion and ignorance of Hilberg, Vrba and other prosecution witnesses were exposed for all to see, and resulted in astonishing headlines and reports in newspapers across the country. Vrba's testimony, for example, was torn to shreds, and he had to admit that he had used what he called "poetic license" in composing his incredible memoir about Auschwitz. Among those who testified on Zündel's behalf in the two trials were Dr. Robert Faurisson, Mark Weber, Dr. William Lindsey, Udo Walendy, and Bradley Smith. As a result of the two trials, an enormous quantity of compelling evidence refuting the Holocaust extermination story was presented to the court and thereby was made part of the permanent public record. The most important of this evidence was the historic testimony of American gas chamber expert Fred Leuchter about his on-site forensic examination of the alleged extermination gas chambers in Poland. Zündel was found guilty in the 1985 trial, but the verdict was set aside by the provincial appeals court. It ruled that the judge in that trial had, among other things, given improper instructions to the jury, and had improperly excluded defense evidence. In May 1988, at the conclusion of the second Zündel trial, the jury declared him guilty. A few days later, he was sentenced to nine months imprisonment. After carefully considering his appeal of the 1988 guilty verdict, the Supreme Court struck down as unconstitutional the law under which he had been convicted. On August 27, 1992, the judges specifically affirmed that Zündel's publications, including the revisionist booklet, are protected under the country's Charter of Rights. The Court categorically endorsed key arguments that had been made by Zündel and his attorney during the two trials. What was achieved in this protracted legal battle against much better financed and entrenched foes is a tribute to his organizational ability and extraordinary personality. Zündel's last great legal battle in Canada was fought out before the Canadian Human Rights Tribunal in Toronto on charges, instigated by Jewish groups, of promoting "hatred or contempt" against Jews through the "Zündelsite" Internet web site operated by Ingrid Rimland from the United States. Among the groups opposing him in this case -- in which the truth or validity of the supposedly "hateful" items was not a consideration -- were the Simon Wiesenthal Center, the Canadian Jewish Congress, the Canadian Holocaust Remembrance Association, and the League for Human Rights of B'nai B'rith (counterpart of the Anti-Defamation League in the US). The Tribunal ultimately ruled against him, declaring the "Zündelsite" to be unlawful. After 42 years in Canada, including a failed effort to acquire Canadian citizenship, he moved to the United States, where he married Ingrid in January 2000. Since the summer of 2000, they have lived quietly in the mountain region of eastern Tennessee. Of this remarkable man, Robert Faurisson wrote in 1988: "Zündel may once again go to prison for his research and beliefs or be threatened with deportation. All this is possible. Anything may happen when there is an intellectual crisis and a realignment of historical concepts of such a dimension. Revisionism is the great intellectual adventure of the end of this century. Whatever happens, Ernst Zündel is already the victor."